Wow! This necklace uses materials that I've acquired in so many different ways that it's a total supply-collaboration! First off, several weeks ago I made a series of little tube beads and capped them with some of the beautiful 6mm turquoise rondelles that I received from Auntie's Beads. These start with a simple two-bead ladder stitch and then are formed with brick stitch around a crochet hook. Using copper wire, I filled each bead with large seed beads to stabilize it and created a wrapped loop at each end around the rondelles. 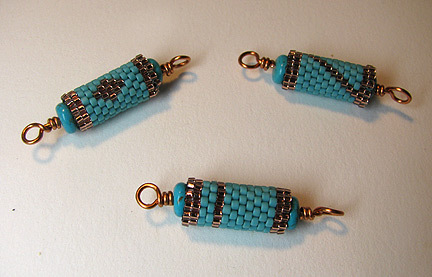 You can get specific step-by-step instructions for making these beads in Nancy Zeller's book, Bead Tube Jewelry . Once these beads were all stitched and finished, the rest of the construction began in earnest. 1. 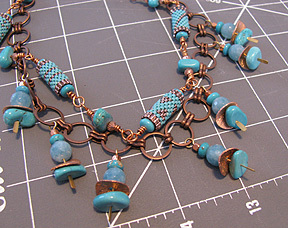 Create links with the copper wire, turquoise chips, and small copper spacers. 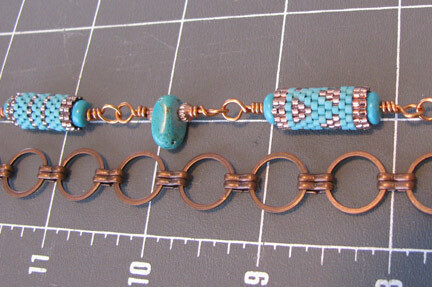 Make wrapped loops and alternate these links with the tube beads. 2. Measure a length of chain to match (more or less) the length of the links. 3. 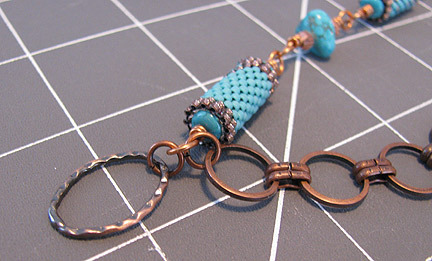 Use jump rings to attach the chain to the links and the links to a large hammered oval link. I ended up needing to add an additional large link on each end to achieve the length that I wanted. 4. 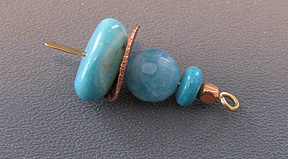 Use head pins and create dangles with turquoise chips, wavy copper spacers, faceted fire agate, small turquoise rondelles, and small copper spacers. Create simple loops on each. 5. Space the dangles out and attach them to the copper chain. 6. Attach the toggle clasp with jump rings. As regards FTC disclosure guidelines: I have received turquoise beads free of charge from Auntie's Beads in order to write a review and/or create a project free of charge for you. I have not been paid for my endorsement as it pertains to the products received. That is a beautiful necklace! I totally thought the tubes were peyote. LOVE the color combination! This is gorgeous - I love the combination of the beadwork with the chain. 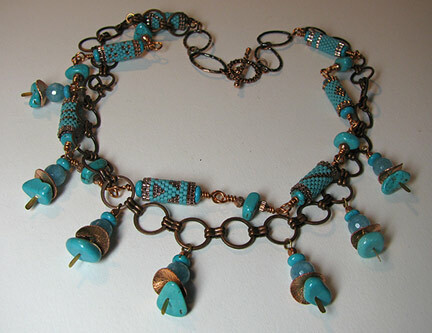 Beautiful You can't miss with the copper and turquoise combo. It reminds me of last year's bead challenge at the Toronto Bead Society. Oh wow! Thanks for that link! I love those stitched tube beads. Did you save two for earrings? I didn't! Why didn't I think of that?? Love this color combo a LOT. Great look. Cyndi, I am just in LOVE with this one! 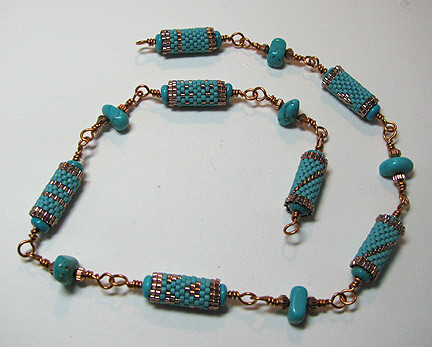 I adore copper, and the turquoise is just perfect with it! It's gorgeous! Gorgeous! 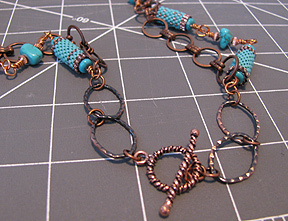 I love copper too- I love how you used the chain with the layer of tube beads- there is so much interest and texture in this necklace! Just gorgeous! Our annual seed bead celebration!